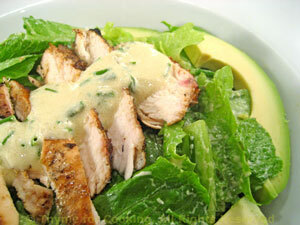 Easy Dinner from Thyme for Cooking: Chicken Caesar Salad. Not the 'classic' Caesar, but delicious... And not high in calories like the restaurant versions. It's made with a yogurt based dressing and the chicken is simply grilled. Use anchovy filets or use anchovy paste that you get in the tube. We'll use it again during the summer. A bit of sugar and Greek Yogurt is wonderful with fresh strawberries.... and ever so much healthier than cream. If you have fresh mint - that will finish it just right! Put into a medium bowl and sprinkle with sugar. Stir gently. 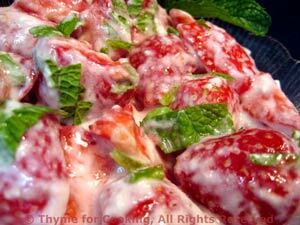 Add yogurt and snipped mint and stir gently. Spoon into 2 small dishes and serve.